Mention Jane Goodall to me and my thought process is "Chimps, Africa, was she the woman from Gorillas in the Mist? I heard that one of the primate scientists was difficult and possibly racist. Was that her or Dian Fossey?" (It was Dian Fossey.) Clearly, I am not very educated about her. My 5th graders are in the PYP Unit of Inquiry: Every Life Has a Story and will be reading biographies. Two girls are doing a book club with My Life with the Chimpanzees so I decided to read it with them. Something that struck me was how privileged Goodall's background is. She grew up in a manor, met the Queen of England, and was a baroness after her first marriage. I guess that makes sense, as it would be difficult to have the opportunity to travel to Africa and volunteer in the 1960s without a safety net. One of the guiding questions for our unit is how the individual has affected change. That question will be so easy for the girls who read this book. 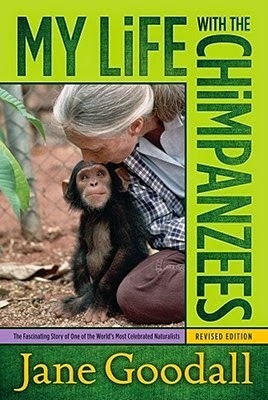 Jane Goodall did so much for chimpanzees, but really for animal rights in general. While I found the book meandering a bit at the end, the bulk of it is fascinating and will give my students some great information on a fascinating person.